Gamification and simulation-based courses are what gives eLearning an edge over traditional training methods. There is no doubt about the benefits of integrating audio + visual + interactive elements into a single package (eLearning course) to explain complex topics, which learners may otherwise find difficult to comprehend using traditional training methods. So what is simulation-based gamified learning? Simulation-based gamified learning is the combination of recreating real-life scenarios through animation or re-enactment, with the ability to play the training course like it’s a game. Basically, learners visualize the intricacies of performing specific tasks and earn badges, points, and levels as they progress through the training. Traditional training is a two-dimensional activity, consisting of training delivery (most commonly lectures) and a post-training assessment (paper-based). A Brandon Hall survey stated: 95% of companies already use some form of video training, because in today’s times- organizations need an approach that is more than two dimensional. As the complexity of topics increase, training takes on a multidimensional approach. These dimensions consist of simulating real-life situations and environments, audio + video elements, and a hint of gamification to spice up the training. So how is this really beneficial to specific industries? Well, some industries need expert training on topics that cannot be explained theoretically. It requires the element of visualization. Most of these industries are service-based where some form of human interactions and labor is involved. Others are manufacturing, and some industries use visualization as a form of safety training, where employees usually work in high-risk environments, e.g. fire escape training for oil miners on an oil and gas rig. Involving gamification and simulation training into the mix presents added dimensions to training, which regular training cannot provide while proving to be highly beneficial to these organizations. Let’s take a look at some industries and how they benefit from these courses. Manufacturing: A production line can be a complicated and a stressful place to work at. Since it involves production on a large scale, there are production schedules to meet with zero tolerance for error. Adding to the stress of mass-production is the element of an intricate assembly process while maintaining strict safety. Automobile and electronic devices manufacturing are few companies where eLearning courses work wonders. By animating complex assembly tasks, workers get a better understanding of how to assemble components, e.g. Many leading automobile manufacturers use animated videos to explain how a complicated gearbox is assembled. These courses outline and show how every nut, bolt, and screw come together, holding different components in their respective places. Furthermore, using the same animated courses, workers put together a gearbox virtually. The course prompts them to solve (much like a puzzle) the exact positioning and fitting of components, which provides a simulated first-hand experience at assembling the actual thing. Training medical staff: Medical staff, physicians, general surgeons, nurse, and doctors have throughout the ages relied on the graphical representations of the human body to learn about its anatomy. The latest eLearning courses allow medical staff to train via a three-dimensional approach. The human anatomy can now be viewed from all angles, and these angles of viewing can be adjusted as per the trainee’s requirement. This is because the courses used here are simulated 3D courses. Situations are also created via simulations, i.e.- the correct method of treating a bone fracture is visually recreated, the learners get to see exactly how a case should be handled and treated. It readies them to handle such situations in real-time. Instead of relying on theoretical knowledge, these staff receive visual training which goes a long way toward retaining and carrying out complex, intricate tasks. Furthermore, paramedics, nurses, interns, and first-aid workers benefit significantly from simulation courses that are easily accessible anytime, anywhere. These courses can range from simple to complex, but, when put in a situation where these personnel are required to treat emergency cases, such courses are very handy. From providing visual guidance on how to provide CPR to safely using a defibrillator, everything can be recreated visually. Hospitality and food-service industry: Large chains benefit significantly from simulating the food preparation process. These courses often outline how their trademark burgers, sandwiches, desserts, and shakes are put together, ensuring the food is standard in its look, taste, and feel globally. The same courses are then used to assess employees. Just like a puzzle employees are required to identify the various ingredients that go into a preparing a dish, e.g.- baking a three-stage cake. These gamified courses are outstanding in explaining the process visually, and retaining the learner’s attention. On the flipside, F&B service-based industries rely heavily on customer interactions. Often, the biggest reason behind a returning patron is the service being provided. By simulating appropriate customer interactions, employees are trained in the ideal way of interacting with customers, e.g. how to serve a patron. The combinations are unlimited. From creating courses that recreate how a perfect hotel room should look to setting up a perfect dining experience. The food industry has infinite scope for simulation-based eLearning as a staple training activity. Fashion and retail: Fashion and retail may probably be the most ideal candidate to apply simulation-based courses to their training mix. Not only do fashion brands rely heavily on visuals to sell their products, but, fashion students and trainees take naturally to colors, shapes, designs, and visuals. This industry has very few people who prefer learning via traditional textbooks. From designing new patterns to silhouetting a dress, everything relies heavily on visual cues and technology. Recreating an intricate sewing style, piecing together different accessories, or mixing and matching colors, all of these activities are easily converted into visual courses which are accessed anytime, anywhere. Furthermore, fashion brands can use simulation courses to train end-customers in different ways an accessory can be worn or mixed and matched. Simulation courses are also used to outline a retail outlet’s interiors. Since large brands strive hard to maintain a standardized in-store appearance, most retail stores create digital courses which describe how a store must look at all times. These courses are aimed at increasing the customer’s in-store experience, which is a highly regarded factor in the retail industry. Just as with the F&B service industry, customer interactions are recreated as eLearning courses to train staff on providing the best in-store experience. Health and fitness: The fitness industry in itself is a gamified industry. Hard work at the gym is rewarded with a healthier mind and body. The industry is pegged at $30.1 billion. With government backing the fight on obesity in the USA, this industry is pegged at increasing even further. Many fitness coaching companies already rely on applications to train clients remotely. Since physical activities require a certain level of visualizing to understand the correct way to workout, these workout videos are a huge hit! Fitness coaching companies create their own videos which are used by customers who log into an LMS (learning management system) and record their progress as they progress through these courses. Furthermore, badges points and rewards act as attention retainers, keeping the learners motivated and interested. Simulation and gamification are definitely futuristic methods of training. As AR and VR make its way into our day to day life, they will soon be the go-to method for an organization to train employees on complex topics. At that point, simulation-based gamified courses will be the primary content fueling training activities. Where safety is an issue, videos and animation courses will always be the staple training format. The benefits of shifting to simulation-based courses are many, and as time passes, these benefits will only continue to increase. At eNyota we have helped create a host of simulation and gamified eLearning courses used by companies in varying industries worldwide. 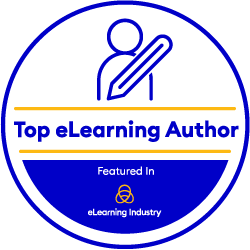 If you are looking to have an eLearning course created reach out to us at contactus@enyotalearning.com and we could help you finalize your next big animated eLearning course! You can also click here and we will shortly get back to you.